The 2017 hiking season officially began for me yesterday. I have been waiting for the temperatures to cool down to a more comfortable place before I joined the AWA hiking group. Thinking out loud: Hiking in the heat is not fun to me. Luckily, the nice weather we have been having continued and we were blessed with perfect weather. The hike starts at Cape D'Aguilar Road. It's a nice easy walk down a narrow road (open to cars) to the Cape D'Aguilar Marine Reserve. At the fork in the road, you can go left to the lighthouse, but we went right toward the Marine Reserve area first. On the way down, we took an overgrown path that led to an awesome cave that opened up to the sea. It was awesome to watch and listen to the waves rolling into the cave. We continued our walk down to the Marine Reserve building. The place looked very run down, but we walked past it, and there was so much to explore. The first thing we saw was Miss Willy. This is supposedly the actual skeleton of a killer whale. There was no information in English to confirm this. The views of the water were just beautiful. We could see the outlying islands, boats and just endless blue sky. We felt compelled to explore, so we climbed the rocks and found more views and crashing waves on the other side. I found a nice little spot to enjoy the view and listen to the waves. I love the sound of waves. Thinking out loud: It would be a great spot to stop and have a packed lunch. Before heading back, the group took advantage of the prime photo backdrop to have some fun. We skipped the lighthouse (Hok Tsui Beacon), but thinking out loud I wish we had taken the time to walk up the road to it. 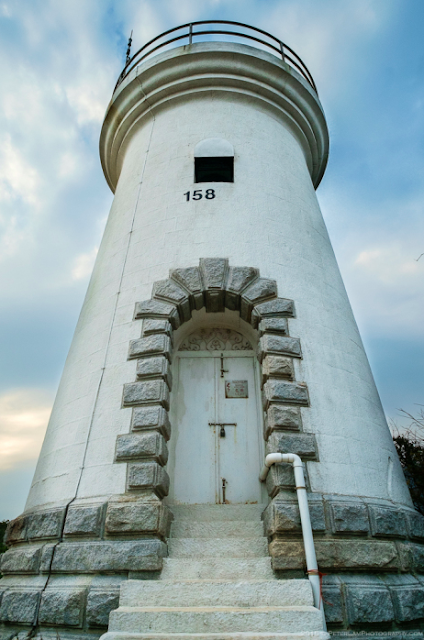 It's not as big as the ones we see in New England, but it is the oldest lighthouse in Hong Kong. We walked back to catch the bus to Shek O for a shared lunch at the Shek O Chinese and Thai restaurant. The casual open air seating was a perfect spot to refuel after a day of exploring. It also gave me a chance to refresh with Shower Pill body wipes (affiliate). After lunch we walked over to Shek O beach to have a look. You can see D'Aguilar Peak and maybe even the lighthouse out on the end of the cape. It is actually possible to hike from the beach over to Cape D'Aguilar. The trail is unofficial and marked only by other hikers leaving chalk marks and flags. I would love, love, love to come back here to play in the water. Hiking to the cape? Maybe. Do you ease into activities because of the weather? Would you hike an unofficial trail? We took the ferry from Discovery Bay.